Astronomers have taken the first direct image of a black hole. By connecting radio telescopes across five continents into one Earth-sized virtual telescope, they managed to resolve the shadow of a supermassive black hole, a prediction of Einstein’s General Theory of Relativity. Black holes have been the realm of science fiction and abstract textbook diagrams for more than a century. No one had ever seen what was deemed an object that, by its very definition, cannot be seen. Ever. An object so alien that it defies our imagination, whose mere presence rips apart everything we think we know about the laws of physics, and so extreme it twists space and time and the very essence of our existence into a swirling, contorted maelstrom of… nothing. Welcome to Messier 87, or M87, a massive galaxy in the Virgo galaxy cluster 55 million light-years from Earth. At its fuzzy, glowing center sits a supermassive black hole, with a mass 6.5 billion times that of our sun. Taking a direct image of the black hole in M87 is a feat that would not have been possible a decade ago. Even though the object is about the size of our solar system, it is so far away that resolving its features across 55 million light-years is like “taking a picture of a doughnut placed on the surface of the moon,” according to EHT Project Scientist Dimitrios Psaltis, a professor of astronomy and physics at the University of Arizona. Supermassive black holes are relatively tiny astronomical objects, which has made them impossible to directly observe until now. The size of a black hole is proportional to its mass, so the more massive a black hole, the larger the shadow. Scientists now think that black holes with masses that are millions or even billions of times that of the sun lie at the centers of most galaxies, with some outshining all of the other stars combined. Thanks to its enormous mass and relative proximity, M87’s black hole was predicted to be one of the largest viewable from Earth, making it a perfect target for the EHT. Eight telescopes came together into one virtual telescope as big as Earth, offering unprecedented sensitivity and resolution. 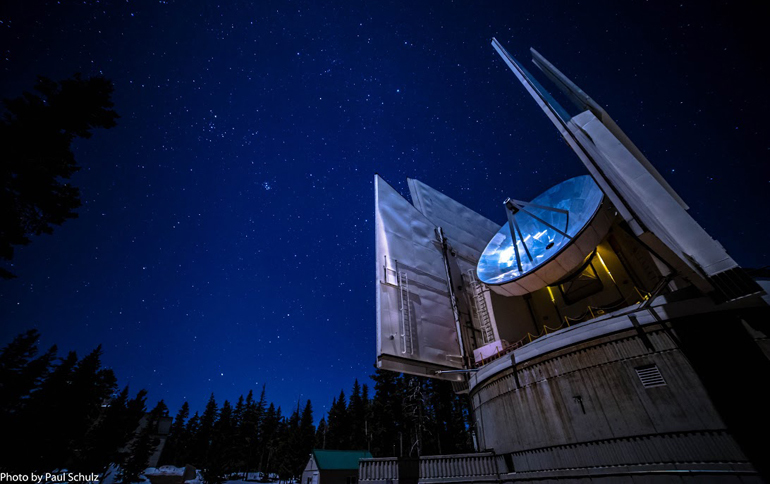 The EHT observations use a technique called very-long-baseline interferometry, or VLBI, which synchronizes telescope facilities around the world and exploits the rotation of our planet to form one huge telescope observing at a wavelength of 1.3mm. After two weeks of observing, the researchers collected about 5,000 trillion bytes of data on 1,000 disks—enough to keep a playlist of high-quality mp3 files playing for 4,700 years. The data were flown to supercomputers known as correlators at the Max Planck Institute for Radio Astronomy in Bonn, Germany, and the Massachusetts Institute of Technology’s Haystack Observatory in Westford, Massachusetts. There, VLBI experts distilled the raw data to a more usable volume. Following calibration of the data, members of the EHT collaborated to reconstruct the black hole images. Working in separate groups using different methods, they all arrived at the same result. Still, how can an object so dense that nothing, not even light, can escape its gravitational pull be seen? As ferocious as they are, black holes are extremely compressed cosmic objects, containing incredible amounts of mass within a tiny region. While the black hole itself is invisible, it gives away its presence by warping spacetime and superheating any surrounding material. As surrounding gas and dust plunge into the abyss of space and time, and entire stars are shredded into wispy swirls, matter piles up around the black hole, forming a so-called accretion disk of plasma—charged particles heated to billions of degrees and accelerated to almost the speed of light. Due to the black hole’s massive gravity, light gets bent around it, creating a tell-tale photon ring, the appearance of which is predicted by Einstein’s equations. If Einstein’s equations are correct, a dark region should appear in the center, caused by the absence of light captured by the black hole. An image of the shadow of a black hole is the closest thing to an image of the black hole itself, a completely dark object from which light cannot escape. In the case of M87, the shadow appears around 2.5 times larger than the true size of the black hole’s boundary—the event horizon from which the EHT takes its name—due to light bending. For M87, the horizon should be just under 25 billion miles across, about three times the size of Pluto’s orbit. Multiple independent EHT observations and imaging methods have revealed a ring-like structure with a dark central region—the black hole’s shadow. 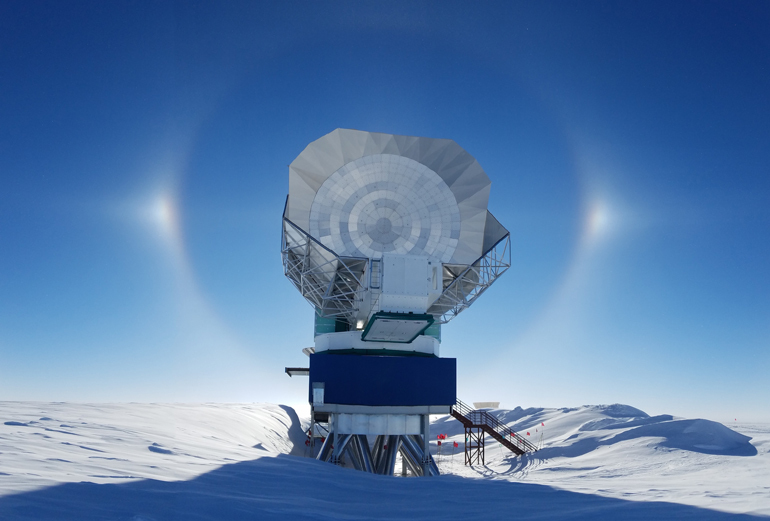 Ozel led the Modeling and Analysis Working Group, which had the task of measuring the size of the black hole’s shadow and comparing the predictions of Einstein’s theories to the EHT observations. Once EHT scientists were sure they had imaged the shadow, they compared their observations to extensive computer models that include the physics of warped space, superheated matter, and strong magnetic fields. In addition to building and maintaining the EHT cloud infrastructure, the team generated high-fidelity models of EHT observations by harnessing the power of a supercomputer consisting of 140 Nvidia graphics-processing units, or GPUs, commonly used for graphics-heavy video-gaming applications. 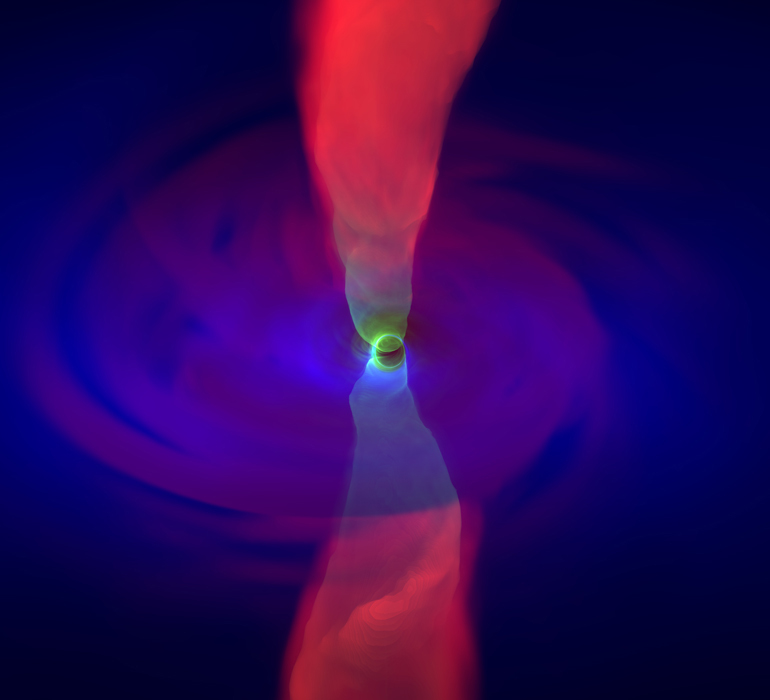 The team developed the first code that traced the path of light and simulated its encounters with black holes to compute realistic images of black holes. The time-dependent simulations of the black hole’s shadow as predicted by general relativity are hosted in the CyVerse, with headquarters at the university. They help scientists visualize light trapped in the fabric of space and time, curving around the black hole by its massive gravity, to study how black holes interact with nearby matter. The EHT consortium involves more than 200 researchers from Africa, Asia, Europe, North and South America, and consists of 13 stakeholder institutes (listed alphabetically): the Academia Sinica Institute of Astronomy and Astrophysics; the University of Arizona; the University of Chicago; the East Asian Observatory; Goethe-Universität Frankfurt; Institut de Radioastronomie Millimétrique; Large Millimeter Telescope; Max Planck Institute for Radio Astronomy; MIT Haystack Observatory; National Astronomical Observatory of Japan; Perimeter Institute for Theoretical Physics; Radboud University; and the Smithsonian Astrophysical Observatory. The work involved a network of telescopes around the world: the South Pole Telescope; the Submillimeter Telescope on Mount Graham in southeastern Arizona; the Atacama Large Millimeter Array, or ALMA, and the Atacama Pathfinder Experiment, or APEX, both in the Chilean Atacama Desert; the IRAM 30-meter telescope in the Spanish Sierra Nevada; the James Clerk Maxwell Telescope and the Submillimeter Array in Hawai`I; and the Large Millimeter Telescope Alfonso Serrano in Mexico. This research appears in a series of six papers published today in a special issue of The Astrophysical Journal Letters.